I am sure most of you have seen the videos going around on facebook for monkey bread. Every time I see one my mouth begins to water. Doesn't matter how many years I have been making these. Doesn't matter if I had just eaten one the night before, every. single. time. I see the videos I must have monkey bread. It is so easy to make. It is so delicious. It always looks incredible. Heck, it always tastes incredible. 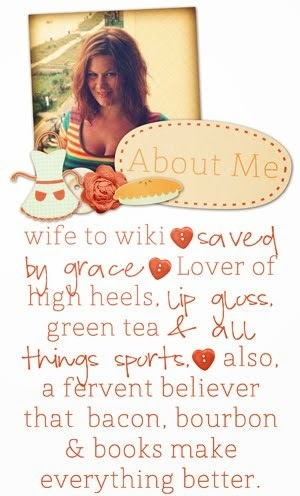 Plus, you can make so many versions. One version I have for you today is pumpkin spice monkey bread with butterscotch sauce and heath bar bits. It is so delicious and was a complete hit at the birthday party when I served it. Preheat oven to 350 degrees. Grease a bundt pan. Cut each biscuit into quarters. Dump the sugar, pumpkin spice, and cinnamon in a large ziplock. Add in the biscuit pieces and shake to coat. Drop the pieces in the coated bundt pan and fill about a third the way full. Cover with half the heath bar pieces and butterscotch sauce. Fill the pan with the rest of the biscuit pieces, aiming sure to not fill more than 3/4 of the way full. Then use remaining heath bar pieces and pour the remaining butterscotch sauce over the biscuits, doing your best to cover as many pieces as possible. You can always use more butterscotch sauce if you feel it needs it. This is a recipe that you really can't mess up. Do your thang now. bake in the oven for 30-40 minutes until edges are a nice and crusty and don't forget gooey! After it cools for about half an hour, place a plate over the bundt pan and slowly turn over to release the monkey bread. This is when you sneak a few bites in when no one is looking. Go ahead, I won't tell. If you can't get enough of the butterscotch, pumpkin, and heath bar combo, check out my other blog for this yummy donut hole recipe. 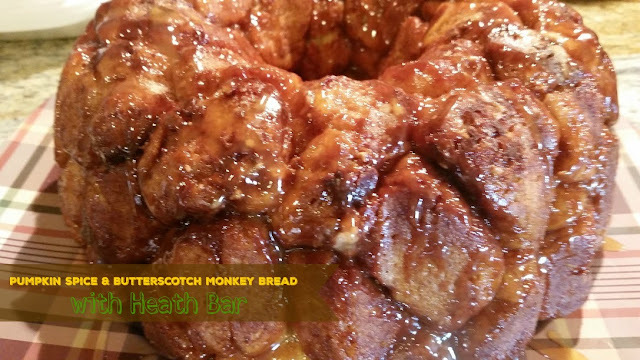 This looks amazing, I have never made monkey bread but it sounds amazing!